Same day sewage backup Coral Gables services, experienced, affordable! There is something for everyone at the Fairchild Tropical Botanic Garden. Walking paths provide close up looks at exotic plants, flowers and fruits. Hidden trails take you to 11 beautiful lakes surrounded by wild undergrowth that leave you feeling refreshed and at peace. One place you never want to see a lake is in your bathroom. Don’t let sewage backup turn that feeling of tranquility into despair. 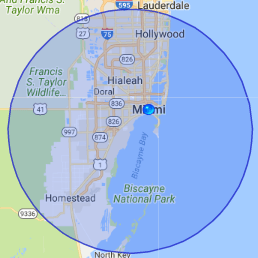 Call our specialists at 911 Restoration Coral Gables and we will respond in 45 minutes bringing you peace of mind with a free inspection and latest in drying and sewage treatment technology. Why is my Toilet Flooding? Our sewage backup Coral Gables team explains that a toilet overflow can happen for a number of reasons and our skilled technicians can identify and fix them all. – Full or partial pipe blockage caused by flushed paper products (e.g. facial tissues, sanitary napkins, tampons and diapers), large amounts of food going down the disposal or oils clinging to the pipes. The most common culprit of sewage backup is pipe blockages. When pressure builds, a wave of returning water can come back into your home and result in a number of problems including a ruptured hose, a washer burst, plumbing leaks and sewage backups. Sewage in your home is dangerous. It is important that you take preventative measures and use proper clean up procedures to reduce the risk of infection. That’s where 911 Restoration sewage backup Coral Gables specialists come in. Why do I Need a Specialist to Clean up my Sewage Spill? While grey water comes from your sinks and showers, black water spills come primarily from your toilet and are a category 3 disaster. That means they contain dangerous pathogens found in human waste. When you experience a sewage backup you need to contain the spill as quickly as possible to prevent bacteria from spreading through your house. If left unchecked, unsanitized, and improperly dried, mold spores may grow resulting in more damage to your home and unsafe living conditions for your family. 911 Restoration Coral Gables is your one stop shop for your plumbing repair and restoration needs. With over 35 years of experience we’re more than just a plumbing company. Our sewage backup Coral Gables technicians are specially trained to remove sewage safely without cross contaminating other areas of your home. They are also highly skilled at water removal, clean up, and water damage restoration, ensuring that your family is safe from bacterial contaminates and harmful molds which can thrive if moisture remains. 911 Restoration is a licensed, insured and bonded disaster restoration business that works with all insurance companies providing you with the highest quality same day service at an affordable price. We value professionalism and are available 24/7 to meet your needs. Call us today!